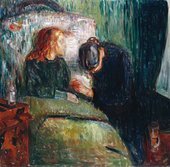 There was no common stylistic technique that connected the artists of the 43 Group, except a commitment to free expression and an appreciation of post-impressionism and expressionism. Many of the members associated with the group were well traveled, had studied in Europe, and were frustrated by the reactionary approach to modern art back in Colombo. Salon style meetings were held at the house of Lionel Wendt a photographer and patron of the arts. In 1955 the group exhibited at the Venice Biennale, where they were championed as a radical example of modern Asian art. The group disbanded in the mid-1960s as the political climate worsened in Sri Lanka and many members emigrated. Artists associated with the 43 Group include: Harry Peiris, Justin Deraniyagala, George Keyt, Ivan Peries, Richard Gabriel, Aubrey Collette, L. T. P. Manjusri, W. J. G. Beling, George Claessen and their patron, the photographer Lionel Wendt.